Bolle 11467 11467 Draft Shiny Black - CompetiVision Gun + TNS FREE SHIPPING! Designed and constructed to meet the needs of the world's top athletes, the Draft Shiny Black CompetiVision Gun + TNS sunglasses from Bolle offer a powerful advantage on the courts. Optimized for the tennis court, the glasses feature Bolle's patented CompetiVision® lenses that enhance yellows while dimming all other colors, resulting in a vibrant tennis ball that is easier to see. A TNS coat has been added to offer additional protection from the sun, ensuring that nothing gets in the way of winning the match. 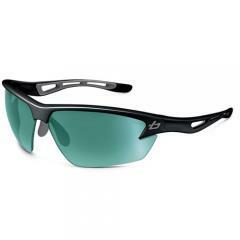 The wrap-around style coupled with a bottomless rim offer uninhibited field of view while delivering full eye protection from airborne irritants. Rubberized arms constructed from a lightweight, impact-resistant plastic ensure the Draft Sunglasses stay firmly in place from the first serve to the match point. ©2002-2019 CopsPlus.com: Bolle 11467 11467 Draft Shiny Black - CompetiVision Gun + TNS FREE SHIPPING!